MasterChef – it’s not over yet! MasterChef was a massive time investment for me. Like millions of others around Australia I quickly became hooked on watching amateur chefs tackle culinary challenges that were beyond incredible – I’m still dreaming of that V8 Cake and the guava snow eggs. 1. Meals don’t magically appear on the table each night – someone (me) has to make them. 2. Good food doesn’t come ready-to-go in packets – it has real ingredients like vegetables. 3. Yes, kids can cook. Kids can cook meals for the whole family! (I wouldn’t say no to macadamia nut crusted barramundi). No doubt Junior MasterChef will have oodles of kids raring to go in the kitchen and they can equip themselves with all the right MasterChef gear. From cake and cookie kits to egg and rice kits, all the equipment they need plus some simple recipes are included for little apprentices. Kids can also look the part with MasterChef hats and aprons. So whilst I might be waiting a while for that eight layer vanilla cake, I can enjoy some scrambled eggs whipped up by my eight-year-old now. 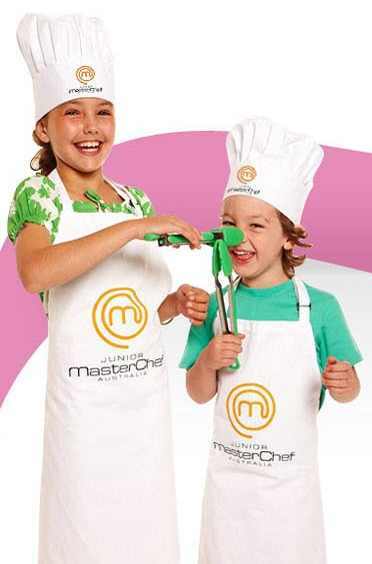 Junior MasterChef kits range from $29.95 to $39.95 and are available from 4 Kids Who Cook.